The Dodge EV concept was revealed in a flourish of showmanship directly ahead of the time the not-so-Big Three went before Congress begging for a loan to retool for greener cars, but the LA Auto Show is the first time we're getting a close look at it. 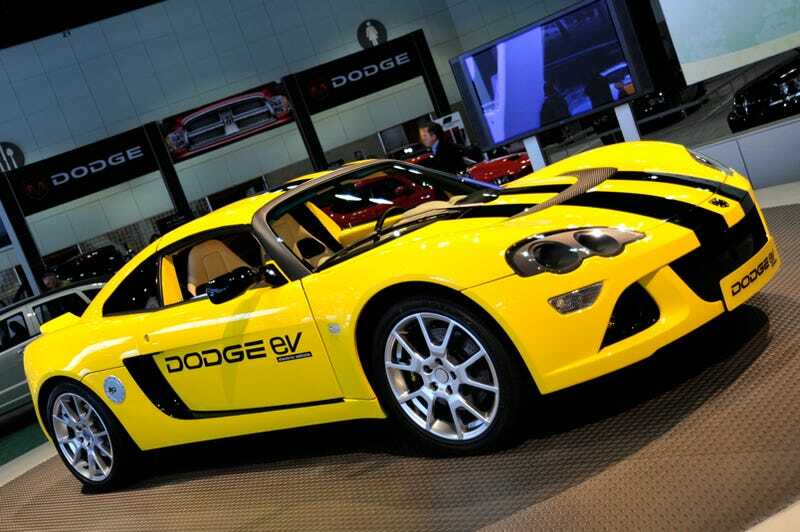 The Dodge EV, an all-electric version of the Lotus Europa fitted with a Dodge badge, lithium-ion battery pack and an electric motor, is apparently able to hit a 0-to-60 MPH in under five seconds with a range of 150-200 miles. But what does it look like in person? Thanks to a turntable and a steady hand we've got a 360 degree look at the Proton, Lotus, Dodge EV below the jump.